The Molotok is a trail simplifier. It simply rolls over obstacles that would cause other bikes to get rejected or stall out. It flows up, along, and down the trail and is a great platform for riding all day. If all you have is a Molotok…hammer the trails! 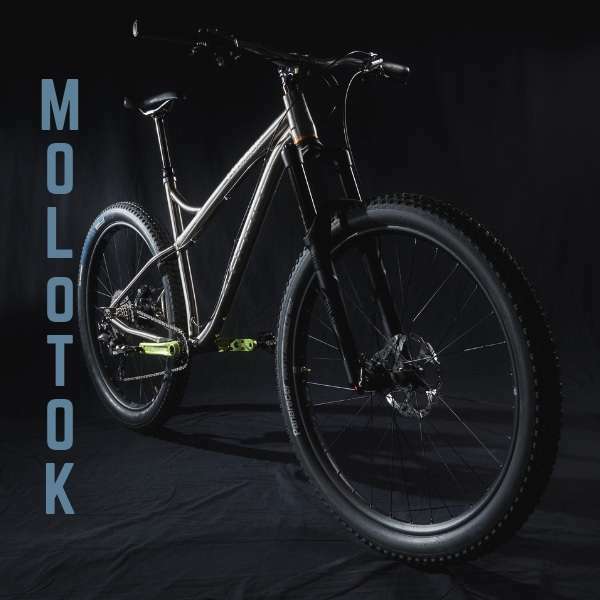 The Molotok’s modern forward geometry creates a bike with a long front center, long wheelbase, and long fork travel. It’s boost frame can accommodate up to 29 × 3.0 tires. The Molotok has been ridden hard with both 3.0 tires and the newer semi-plus 2.6 tires. It’s a fun ride either way! The 3.0 tires provide tons of traction and roll over everything in sight, while the 2.6 rubber isn’t far behind and feels a bit more nimble. The titanium construction is light, and the size large prototype with 29 × 3.0 rubber was only 29 lbs ready to go. Find out more about the Molotok.